Incredibly adaptive and fun with our unique patented gear you totally connect with your body. By moving in the water with uniform resistance and support the water increases your strength and range of motion dramatically. 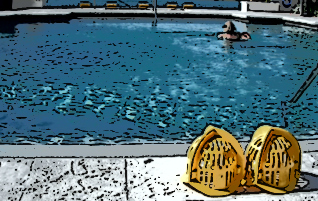 Home, Condo, Apartment private one-on-one, semi-private or group class we can work with any pool. 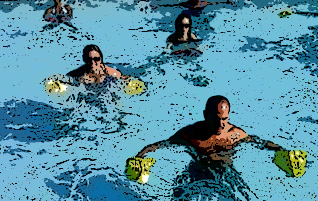 How about cranking up your pool party, corporate event or family gathering to include a fun, dynamic, healthy approach to working out in the water all to the music you love. 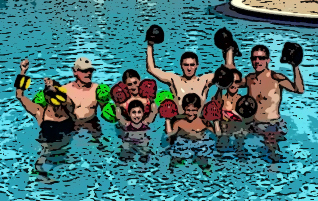 Let us design a water fitness program to suit your needs. From tri-athlete to hip replacement recipient or pregnant fitness junkie to arthritic septuagenarian we got you covered. Just tell us what your goals are and let our professional trainers design a water fitness program right for you. What's better than sharing the AquaFit Miami experience with friends and/or family. Our gear and workouts are so adaptive we've had kids working out with their parents and grandparents all together. We'll Work You Out and You'll Love AquaFit Miami! Since 2008 AquaFit Miami offers one-on-one or group personal training with a Certified Aquatic Fitness Instructor coming to your pool or ours in Miami/Dade using state of the art omni-directional water fitness gear which we sell. AquaFit is NOT buoyancy foam equipment nor is it like any aqua aerobics or water class you may have experienced. What sets us apart right from the start is the gear we use. 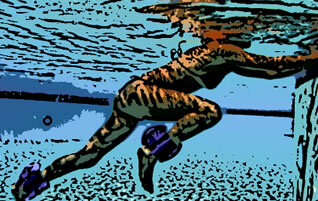 This site provides detailed info on how you can benefit from the technological advances of water fitness. Increase core strength, flexibility and range of motion while building lean muscle mass and accelerate fat loss. The Evolution of Fitness has come to South Florida and it is up to you to start thinking out of the box and enjoy a personal workout in a refreshing hospitible environment. Push yourself to the limit without punishing yourself. The fact is you get quicker, better more balanced results in a relaxing setting and most significantly in a safer environment. We hope you'll give AquaFit Miami a try to see for yourself. Gentle yet effective in allowing you to stay in shape up right up to delivery day (with your doctors permission). These photos/videos were shot the day before mom gave birth to twins! New meaning to the family that works together, plays together. 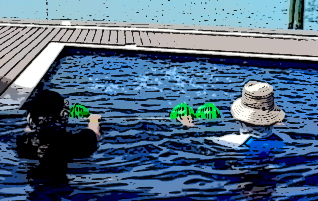 Three generations working out in the pool together all enjoying a taxing yet rewarding water workout in the warm sunshine. Can you honestly say you utilize your pool? What better way to stay in shape than have a certified water fitness trainer come to your pool gym, crank some music and get you moving. A recent health magazine article breaking down the reasons why you should try working out in the water and why it makes so much sense. Are you self conscious about how you look in the gym. Get in the water so you don't have to worry about onlookers or that gym smell. So what to do after your doctor/PT has told you "you're done", "you're on your own" but you don't feel done. Well that is where we can help.